After a disastrous week in terms of results, Real Madrid have been dealt more bad news as Vinicius Jr is reportedly set to be sidelined by injury for two months. Los Blancos lost twice to rivals Barcelona to exit the Copa del Rey and fall further out of the La Liga title picture before suffering a humiliating home defeat to Ajax which saw them crash out of the Champions League. 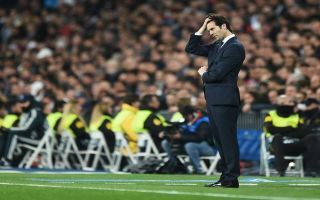 In turn, Santiago Solari and his players are already under immense scrutiny and pressure, and so the last thing that the Argentine tactician needed was an injury blow. Unfortunately for him, that’s exactly what he’s been dealt with as Mundo Deportivo report that Vinicius Jr could now be ruled out for up two months due to a torn ligament. It really is a massive blow considering the impact that the 18-year-old has made this season, scoring three goals and providing 12 assists in 28 appearances for the senior side. With that in mind, it will now rob Solari of one of his more consistent performers in the final third, and will serve to ramp up the pressure on the others to step up and produce in the teenager’s absence. Real Madrid sit in third place in the La Liga table, 12 points adrift of Barcelona and five behind second-place Atletico Madrid. Their only objective now is to push their rivals at the top of the standings and hope that they slip up along the way, but losing Vinicius will certainly not help them in their bid to do that.